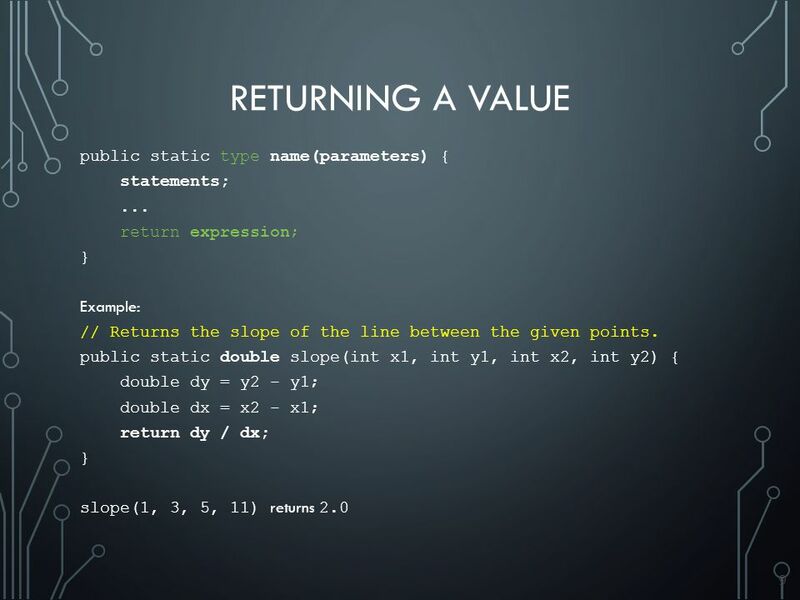 1 MATH METHODS THAT RETURN VALUES. 2 JAVA'S MATH CLASS. 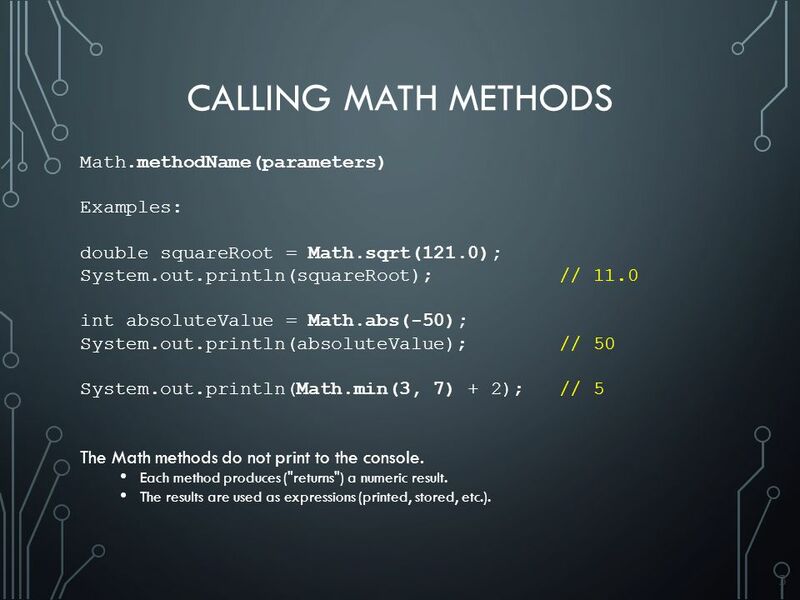 3 3 CALLING MATH METHODS Math.methodName(parameters) Examples: double squareRoot = Math.sqrt(121.0); System.out.println(squareRoot); // 11.0 int absoluteValue = Math.abs(-50); System.out.println(absoluteValue); // 50 System.out.println(Math.min(3, 7) + 2); // 5 The Math methods do not print to the console. 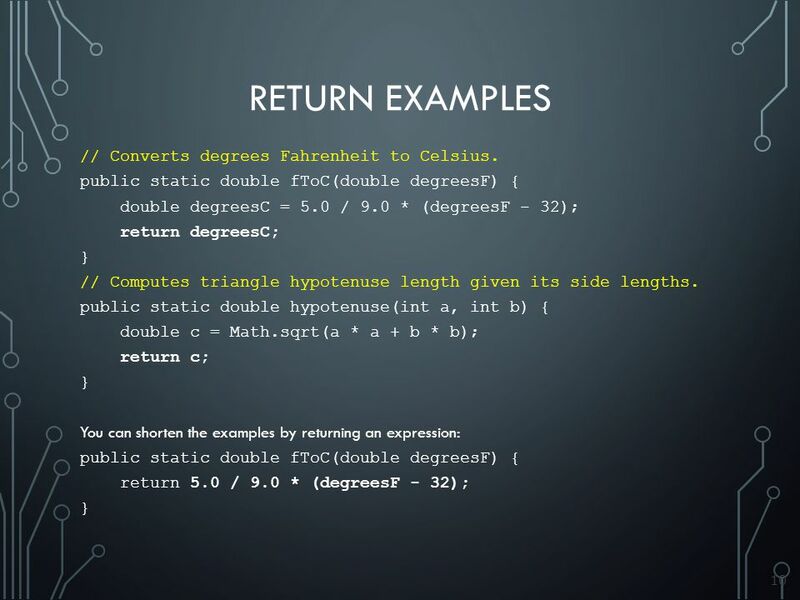 Each method produces ("returns") a numeric result. The results are used as expressions (printed, stored, etc.). 4 4 RETURN return: To send out a value as the result of a method. 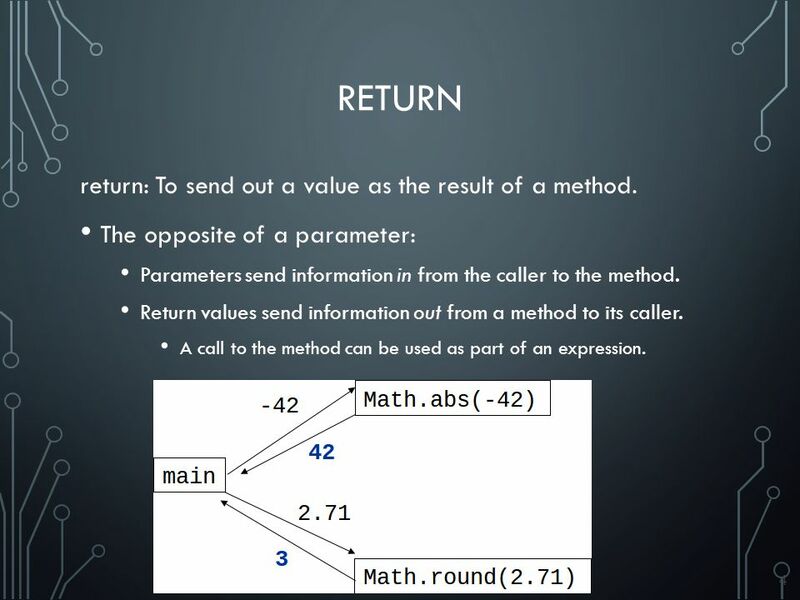 The opposite of a parameter: Parameters send information in from the caller to the method. Return values send information out from a method to its caller. A call to the method can be used as part of an expression. 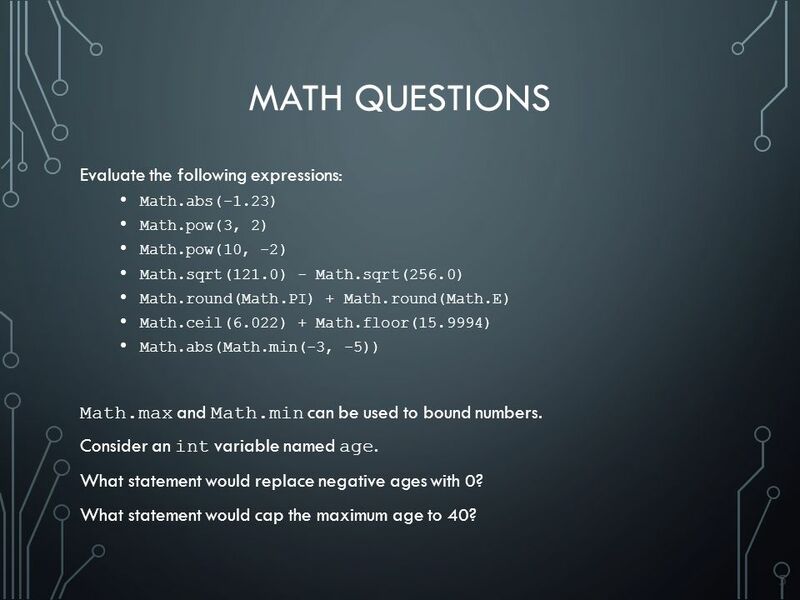 5 5 MATH QUESTIONS Evaluate the following expressions: Math.abs(-1.23) Math.pow(3, 2) Math.pow(10, -2) Math.sqrt(121.0) - Math.sqrt(256.0) Math.round(Math.PI) + Math.round(Math.E) Math.ceil(6.022) + Math.floor(15.9994) Math.abs(Math.min(-3, -5)) Math.max and Math.min can be used to bound numbers. Consider an int variable named age. What statement would replace negative ages with 0? What statement would cap the maximum age to 40? 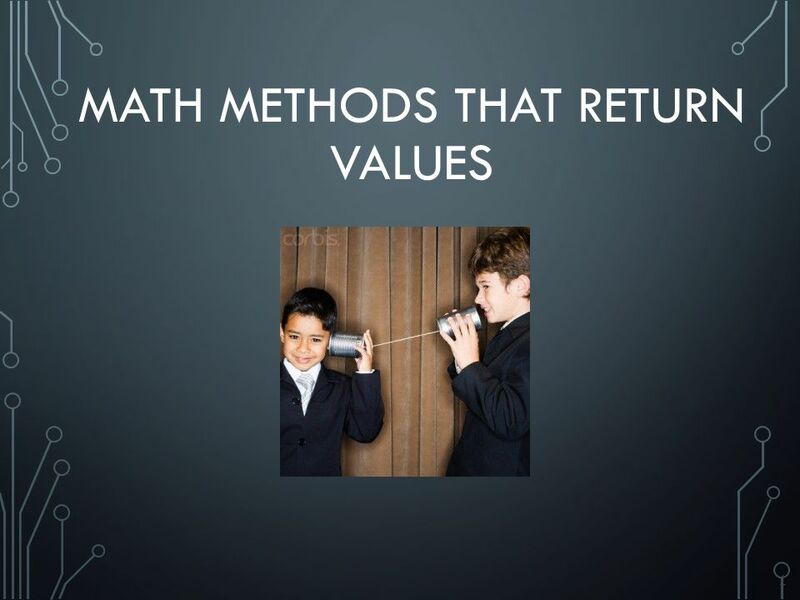 Download ppt "1 MATH METHODS THAT RETURN VALUES. 2 JAVA'S MATH CLASS." Etter/Ingber Engineering Problem Solving with C Fundamental Concepts Chapter 2 Simple C Programs. 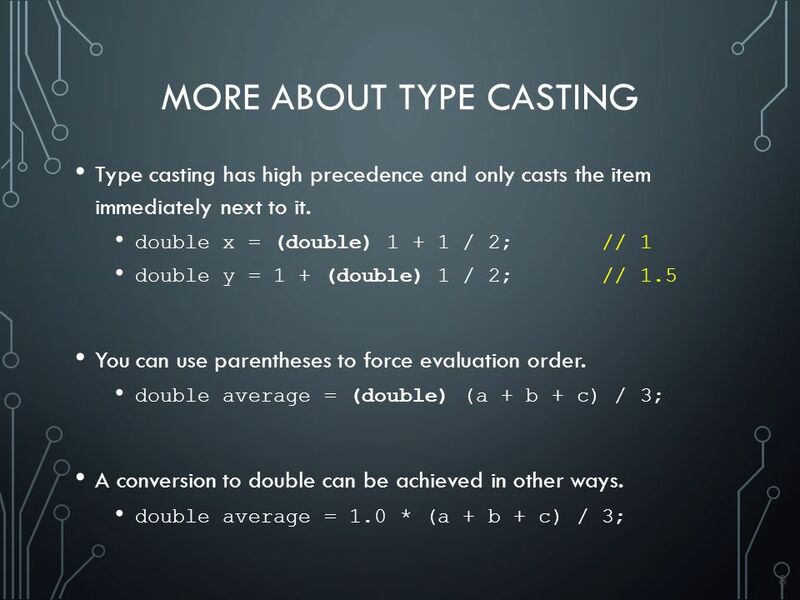 Chapter 4 Methods F Introducing Methods –Benefits of methods, Declaring Methods, and Calling Methods F Passing Parameters –Pass by Value F Overloading. 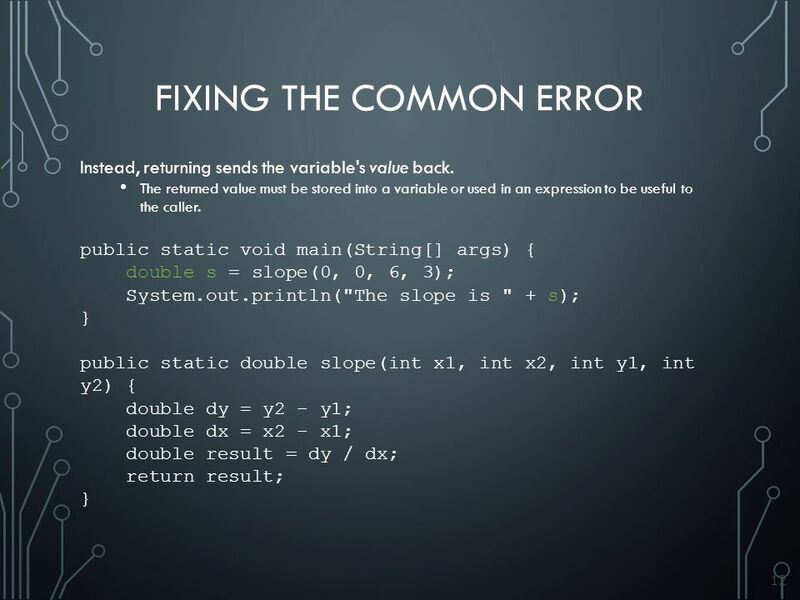 Java Math Class. What is the Math Class? 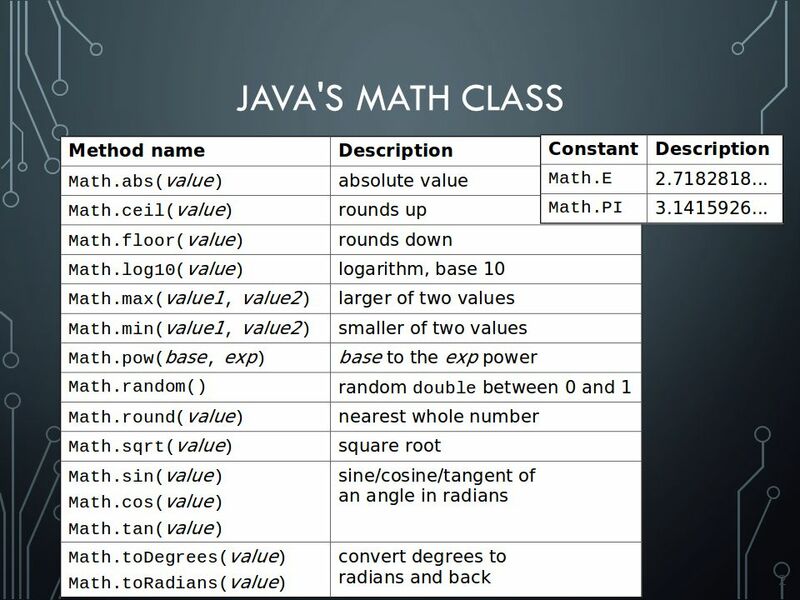 The Math Class is another class that is prepared by Java for us to use We use this class for mathematical operations. 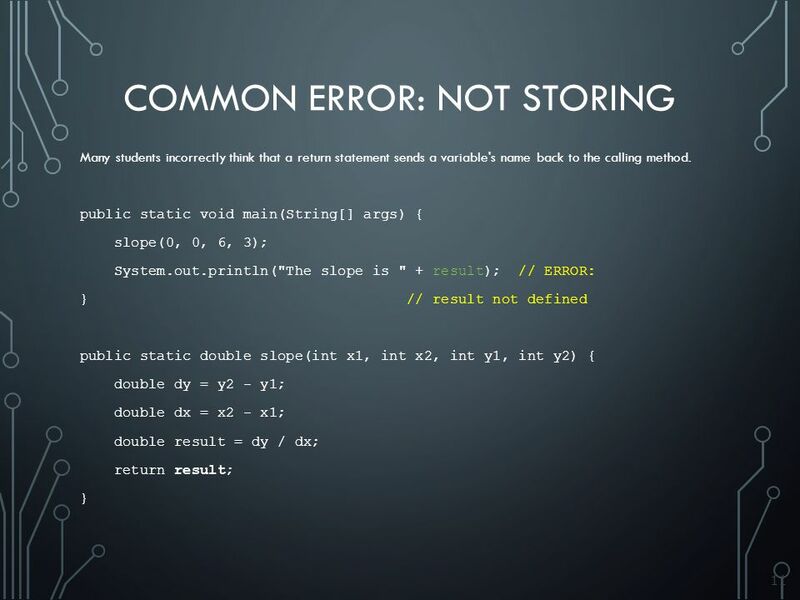 Objects contains data and methods Class – type of object Create class first Then object or instance String – defined class String s; // creates instance. L2:CSC © Dr. Basheer M. Nasef Lecture #2 By Dr. Basheer M. Nasef. Introduction to Computing Concepts Note Set 7. 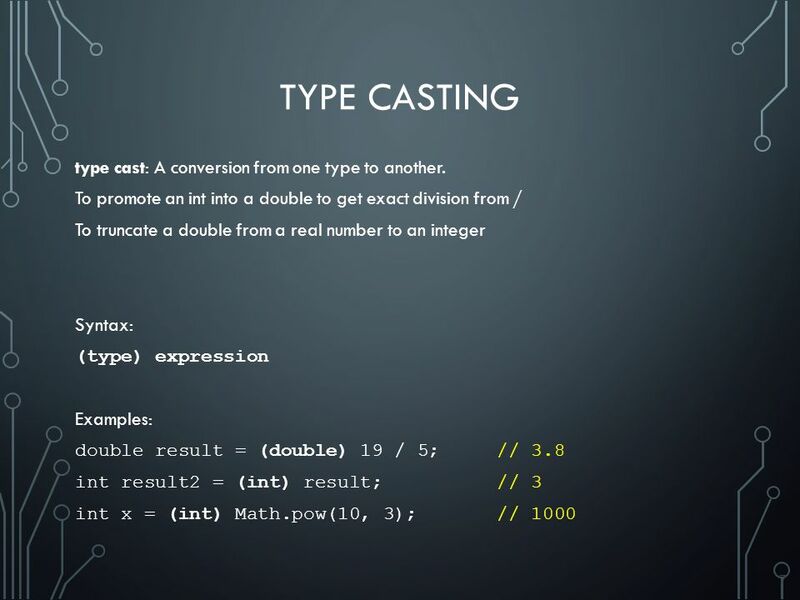 Overview Variables Data Types Basic Arithmetic Expressions ▫ Arithmetic. Pemrograman Dasar - Data Types1 OPERATOR. Pemrograman Dasar - Data Types2 Arithmetic operator  + - * /  / operator denotes integer division if both. 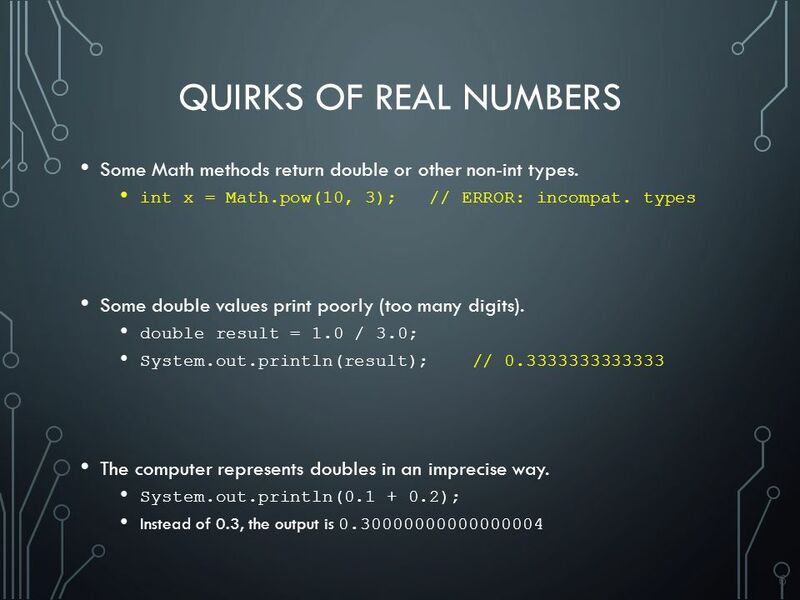 Introduction to Computers and Programming Lecture 4: Mathematical Operators New York University. Copyright 2008 by Pearson Education 1 Building Java Programs Chapter 2 Lecture 2-1: Expressions and Variables reading: 2.1 - 2.2.